Vernon Tancil grew up in Northeast D.C., but he so loved summers on his grandfather's small farm in Hillsdale that his parents let him stay on in September 1937 and attend fourth grade at Birney School. Grandpapa Horace Hansborough grew potatoes, string beans, corn, fruit, and cosmos (his favorite flower) on the hillside property along Douglass Road. On less than three-quarters of an acre, he also kept chickens, pigeons, and a few hogs. Grandpapa Hansborough was born in Culpeper, Virginia, a few years after the end of the Civil War (1861-1865). His father, while a farmer, had owned his mother and many of his older siblings. Widowed in the early 1900s, Grandpapa and his five children moved to Washington. He worked as a gardener at the Naval Hospital on Capitol Hill and as a Navy Yard laborer. About 1918 he and second wife Lula rented a place on Bowen Road. Grandpapa sold produce out of his truck and saved up enough to buy the Douglass Road property that young Vernon visited. their lives in 1949, they still hauled water from a pump at the bottom of the hill and used an outhouse. In the early 1960s, the area still held barns, chickens, and fruit trees. "Almost every yard had a pear tree," Anacostian Rev. Oliver Johnson remembered. "Even if you were poor, you never went hungry." But Hillsdale's rural character was fading fast as city officials rezoned much of Anacostia for apartments. The 525-unit Stanton Gardens replaced Grandpapa's farm in 1965. Matthew Memorial Baptist Church, one block north of this sign, was founded in 1921 by former members of Bethlehem Baptist Church. Location. 38° 51.478′ N, 76° 59.737′ W. Marker is in Hillsdale, District of Columbia, in Washington. 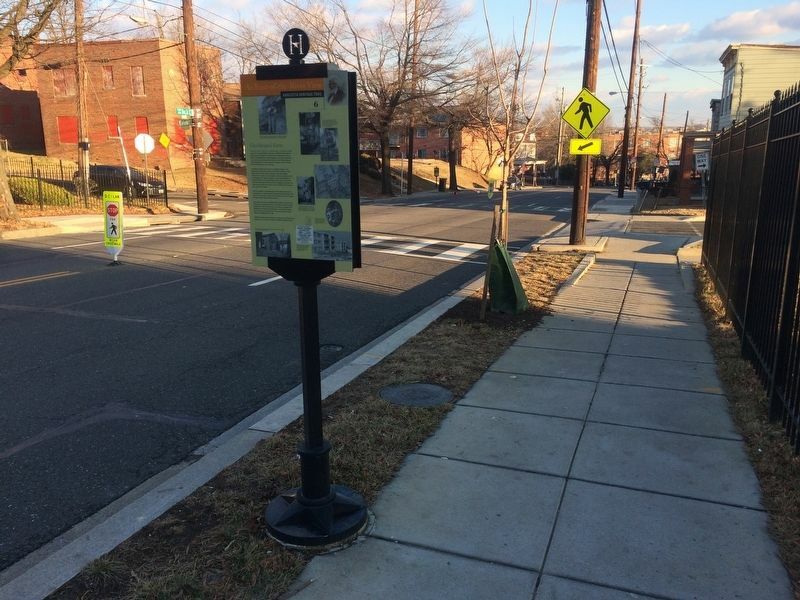 Marker is on Martin Luther King Jr. Avenue Southeast south of Eaton Road Southeast, on the right when traveling north. Touch for map. 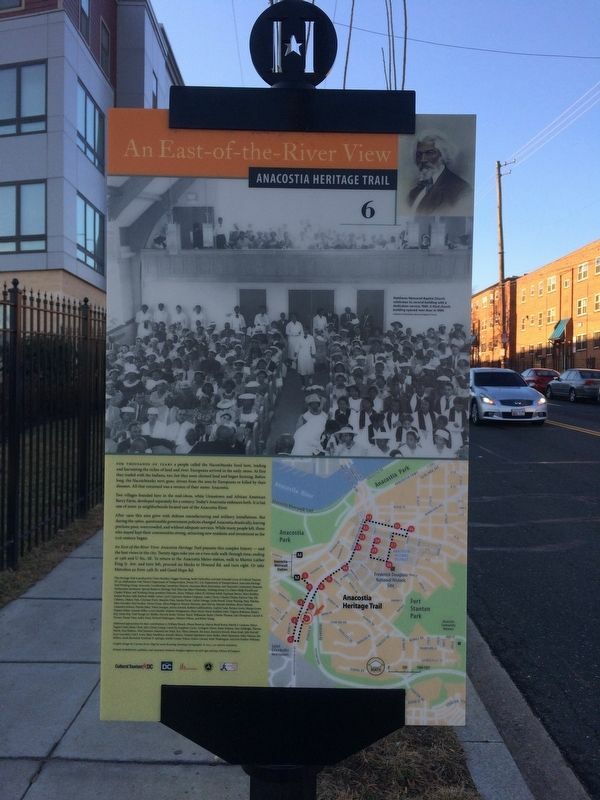 Marker is at or near this postal address: 2631 Martin Luther King Jr. Avenue Southeast, Washington DC 20020, United States of America. Touch for directions. 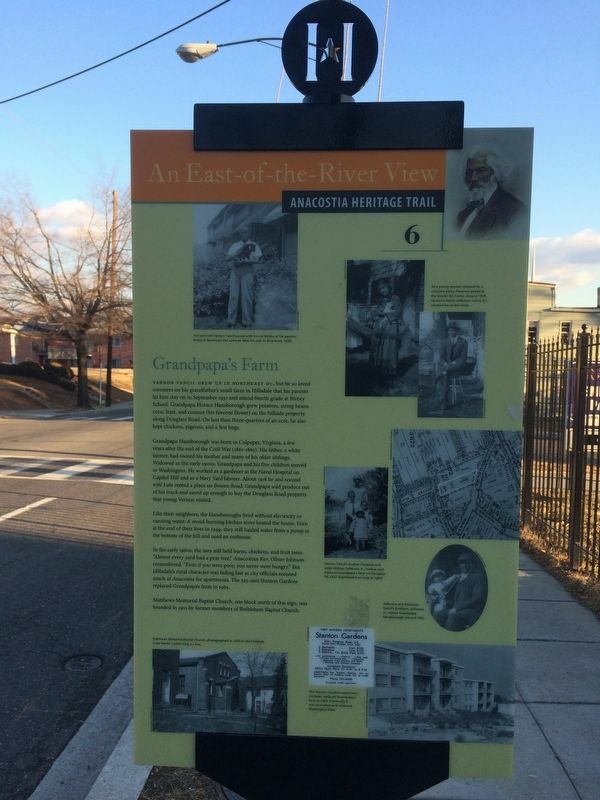 400 feet away, measured in a direct line); Campbell African Methodist Episcopal Church (about 500 feet away); Barry Farm Dwellings (about 600 feet away); Roads That Divide (about 800 feet away); St. Elizabeths Hospital (approx. 0.2 miles away); Faith and Action (approx. ¼ mile away); A Navy Town (approx. 0.3 miles away). More. Search the internet for Grandpapa's Farm. Credits. This page was last revised on March 22, 2019. This page originally submitted on February 2, 2018, by Devry Becker Jones of Washington, District of Columbia. This page has been viewed 75 times since then and 21 times this year. Last updated on March 7, 2019, by Devry Becker Jones of Washington, District of Columbia. Photos: 1, 2, 3. submitted on February 2, 2018, by Devry Becker Jones of Washington, District of Columbia. • Bill Pfingsten was the editor who published this page.